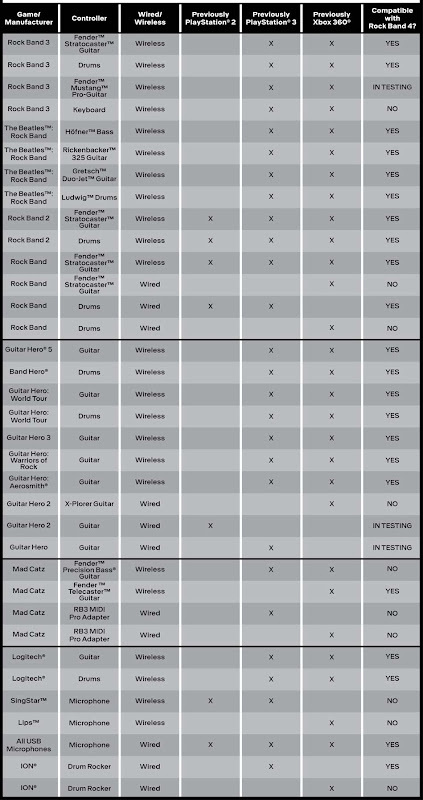 Below you will find an overview of all the Rock Band 4 compatible drums, microphones and guitars. The Legacy game controller allows you to connect multiple Xbox 360 instruments to the Xbox One for use in Rock Band 4. The adapter is connected via USB and allows simultaneous use of up to four different old instruments. So you can also use guitars and drums from Rock Band 2, Rock Band 1 and old Guitar Hero titles on the Xbox One. Of course you can also use this old instruments and new guitars in parallel, however, the maximum number of concurrent players remains at four. Use of the new Rock Band instruments on the Xbox 360 is not possible with the adapter. - Instruments with cables are not compatible with Rock Band 4. - Wireless tools are only compatible within a console family, between Xbox 360 and Xbox One and not between PlayStation 3 and Xbox One. - Xbox One owners will also need to connect a legacy game controller adapter, PlayStation 4 Owners of the connection works without additional adapters.